This quick to make Bakery White Frosting is a light and fluffy frosting made with shortening instead of butter. To make it extra white I used clear vanilla extract, you can us regular, the frosting won’t be as white. I would call this frosting wedding cake frosting. Very forgiving and easy to work with. 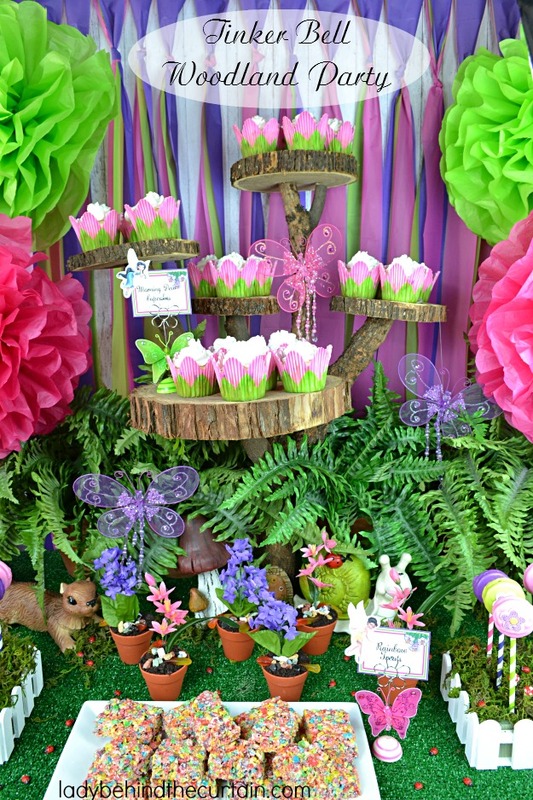 I made this for my Morning Dew Cupcakes I served at my Tinker Bell Woodland Party. This Bakery White Frosting is perfect for the hot weather months. It won’t melt off your cupcakes. Add the shortening to a medium mixing bowl. Beat until shortening is light and fluffy. Add extracts and beat until incorporated into the shortening. Add the sugar 1 cup at a time; beat until smooth between each addition. Add milk only if frosting is too thick. Drizzle in 1 tablespoon at a time until the frosting reaches spreading or piping consistency. 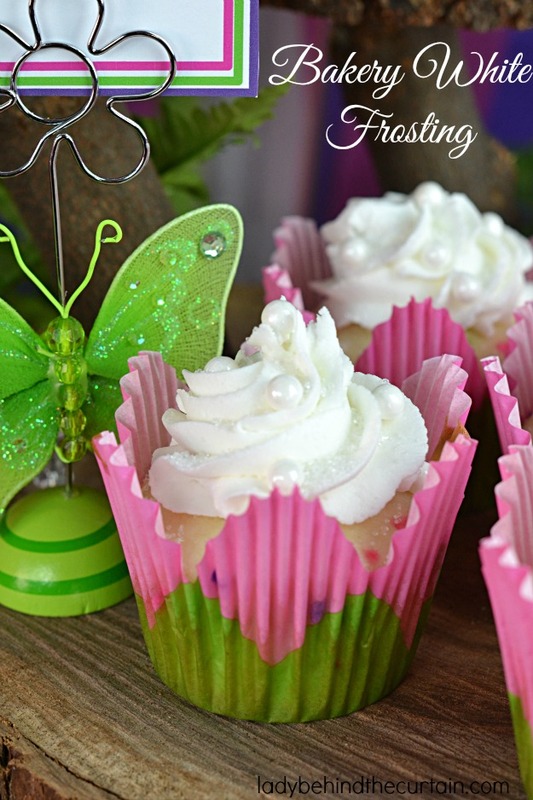 To see how I used this delicious frosting visit my Tinker Bell Woodland Party! Adorable!! 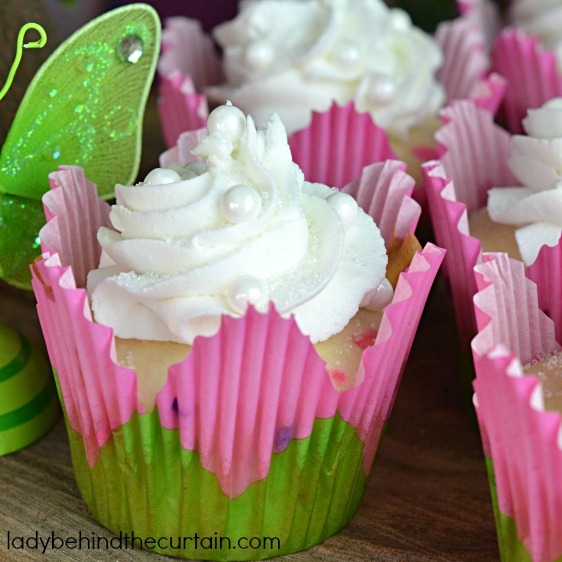 Where do you find the sweet cupcake papers? Thanks Stacy, I found the liners at Michaels. Sheryl- this is amazing. I love doing little (and big) girl tea parties. I would love to do this one sometime ? Did you make the cake stands and all the background stuff? Are the flowers real? This is all amazing. You are so talented. I subscribed hoping to learn how to be amazing like you.